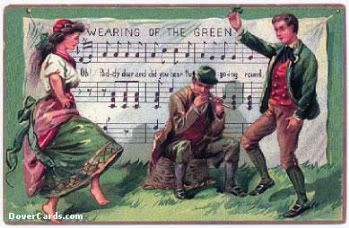 A Happy St. Paddy's Day to you all!! And a happy day to both of you, too! As you can tell, we did have a happy day. ::g:: I hope yours was, too! Do you think he'd come back and drive the snakes out of Congress? PS Tell Miss M that Pi are round. Cornbread are square. Do you think he'd come back and drive the snakes out of Congress? That's a miracle even beyond the powers of St. Patrick, I'm afraid. Severus joins me in saying Happy St. P's Day to you, too. When I was a kid, the St. Patrick's Day Parade was a major highlight. My half-Irish mom would sometimes take us out of school to go to it. Dancers! Irish wolfhounds! Pipers! Leprechauns in little cars throwing green candies! the St. Patrick's Day Parade was a major highlight. ::gggggggggggg:: Maybe you can join us next year for the whirlwind tour! It will be a Saturday next year . . . .